So, I went to my first ever council meeting last night, a public meeting concerning the possible sale of Old Manor Way Playground in Barnehurst. This is just one of the 27 open spaces Bexley Council is proposing to sell off, or “considering for disposal” as they put it. Old Manor Way Playground is the only site specifically for children on the list, but is certainly not the only well-used park on the list. This isn’t just a case of selling off odd patches of unused land. The meeting was hosted and led by Councillor Alex Sawyer, Cabinet Member for Community Safety and Leisure at Bexley Council. Barnehurst’s Conservative Councillors were in attendance, as was the local MP David Evennett, although it was made clear that they would not be contributing to discussions in line with ‘purdah’ for the upcoming election. Fortunate timing, perhaps? Two Councillors did, however, man the microphones during the extensive question and answer session. The proposal itself is to sell the sites in order to raise money for what Sawyer dubbed an “endowment fund” to maintain the remaining open spaces in the borough. Sawyer anticipated the money raised would be enough to cover maintenance for the next 10 years, possibly more. Assurances were made that the fund would be ring-fenced. He explained that if the sites were not sold maintenance would be withdrawn on all open spaces and parks across the borough. They would be left to return to meadow. So, essentially he pitched the choice as sell 27 sites, or have no real parks at all in the borough. The 27 sites were chosen as they all fall within the planning designation of being “urban open spaces”, that when particular criteria are met can be sold by the local authority and can be built upon. Essentially Bexley have identified all the open spaces they own that can be developed and are proposing to sell them. This is not them selling some land, but selling all they possibly can. The remaining spaces that fall outside the list cannot be developed, unless planning laws change in the future. The final decision depends on full technical reports on the 27 sites. Essentially, from a planning perspective they can be built upon, but can they be developed from a practical perspective? Any change of use of the sites would be subject to a consultation and planning regulations as usual. 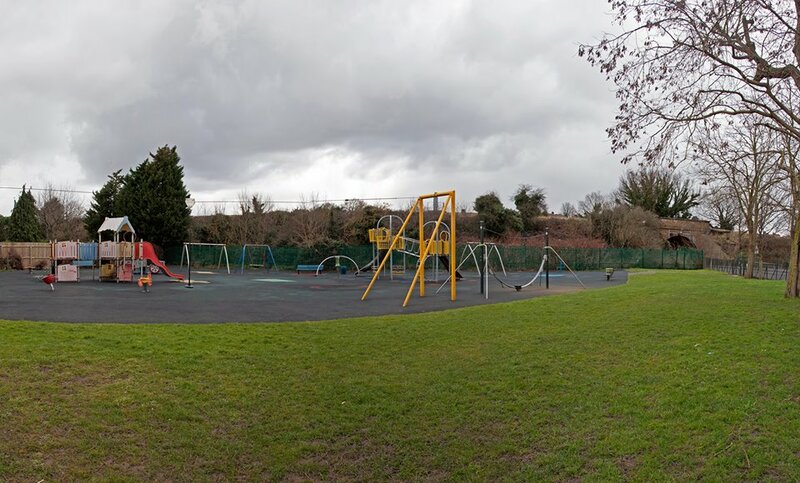 Sawyer explained that with regard to Old Manor Way Playground the Council have considered moving (or “reprovisioning”) the playground up the road to ‘Barnehurst Rec’ – essentially the park at the end of Old Manor Way itself, by the golf course, at the bottom of the hill. There was some debate over what this piece of land is called! Sawyer stated his hope that if this happened the new playground would open the day after the old one closed, considering this “entirely logical”. There were a number of criticisms made of the proposed new site from those in attendance, from its secluded location being unsafe for children and making it more vulnerable to vandalism, to a new playground destroying an area of outstanding natural beauty, through to the hazard of golf balls regularly flying past from the golf course! Sawyer stated that he welcomed any suggestions for alternative sites for a new playground. Sawyer was clear that maintenance of the current playground is not the issue and not the solution. It only costs around £1000 a year to maintain the space. Any saving from sponsorship or community involvement in the playground’s upkeep would be minimal and would be nowhere near the figure the Council stands to make from the sale. There was one funny moment where someone asked Sawyer why they couldn’t just cut the number of councillors in Bexley to save money. Sawyer and his fellow councillors said that was just what they wanted to happen. They didn’t mention that last year they had voted to delay such a move. Sawyer repeatedly stated that he was not happy making this proposal and that he didn’t get into politics to close children’s playgrounds. However, it also appeared clear that while he sympathised with those campaigning to save the playground the only real way it will be saved will be if the technical report of the site suggests the land cannot be safely developed. It was a genuinely fascinating evening. Sawyer said it was good to see this degree of community and engagement with local politics in such an age of cynicism, and with the leadership debates on the television. I have to agree with him on that point. There were over 80 people there fighting for their local area. Most posed at least one question. There would have probably been many more in attendance if the meeting hadn’t been held during the school holidays, and there would certainly have been very many more if the meeting had covered more than just the one site. It was good to see local representatives meeting the people they represent, and to see a local community unite and hold their local authority to account. I dearly hope this campaign is successful. You can find out more about it here. Excellent, Steve. You can now add political correspondent to your list of many talents. A lobby group against the sale of a park local to me a few years ago succeeded in preventing developers building over the park which remains full of kids playing and parents sitting on benches chatting to this day. Thanks for the kind words! Not sure I’ll make a political correspondent just yet, but there is a risk that I might become one of those strange people who enjoys local politics! Good to hear lobbying can work – it seems a fine balance between more emotive arguments to shame the decision-makers, and actual practical reasons why it shouldn’t go ahead. Depressing times, that a local authority is even thinking about selling children’s play areas is grim. The (very) cynical part of me does wonder whether some of the sites have been put on the list but there with no intention of selling, so that when they are removed from the list and the others sold it can be presented as the council listening to local concerns. A good, more balanced piece than I think I would have managed! Your cynical view may turn out to not be far off the mark! I think there is an acknowledgement from Bexley that they haven’t necessarily managed this properly. If they had run the full technical reports on the land before announcing anything then they could have stopped unnecessary upset and alarm. But the whole thing is depressing – that any council could be so hard up, or so unwilling to make cuts elsewhere – that they would be willing to sell off children’s play areas. Have you seen Ikiru? You should watch it right away if you haven’t. Completely relevant, and a desert island movie. I don’t know how the politics over there are but here in the US, good ol’ fashioned guilt works too. I know quite a few people who’ve raised funds to build playground equipment that’s accessible to people with disabilities. I’ve never seen a city council say no to something like that. Over here anyway. I haven’t seen Ikiru – will add it to the list! Guilt can certainly get you so far. Our local councillors only just got in at the last council elections, which I’m sure is playing on their mind when they see families get politically engaged. However, the council itself appears to be near-enough broke and so will do whatever it takes to balance the books, or at least lessen any deficit. It seems that the guilt factor has got the campaigners an audience, but now they need to come up with some compelling reasons not to sell the land. The interesting thing here is that there might be some information around why the land isn’t safe for development – but that might take a while to be confirmed. Ukip Cllr Chris Beazley did propose just a few weeks ago to cut councillor allowances by a third to help save the park. The Conservatives laughed and voted against it, even though one of their promises in last years local elections was to cut councillors by a third. The first thing they did when they got back in was to vote against it!! Isn’t there a web-blog called “Bexley is Bonkers” ?? This seems to be entirely appropriate. Dare I add words like “corrupt” & “incompetent” as well?